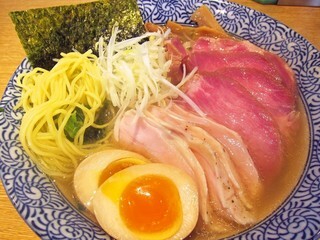 The February 2011 issue of Shokuraku magazine lists the top ten new ramen shops in Tokyo. As most of this information only appears in Japanese I hope by including it in this blog that more people can come to explore these new restaurants. 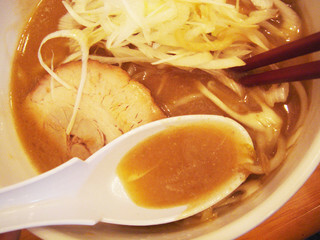 Known for its miso ramen that is rich and thick in flavor. The miso is grilled with lard and a bit of sansho giving it a very unique taste. 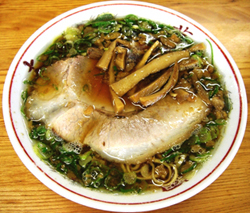 The broth is flavored with niboshi (dried sardines) for a lighter flavored clear soup. The soup is based on chicken and soy sauce. 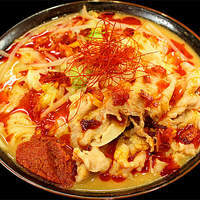 The Kurenai ramen is made with rice miso and a blend of seven different noodles for a variety of textures. Looking at their menu one option is nokomen, or ramen in a rich-flavored broth. But what caught me by surprise is that shio (salt) ramen is served on Wednesday, Friday, and Sunday and shoyu (soy sauce) ramen is served the other days. Definitely looks like a place worth checking out. 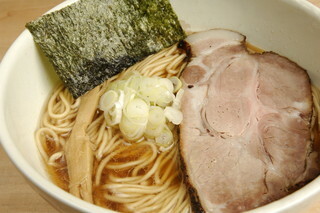 The ramen and dipping broth are served in two different bowls, tsukemen-style. The noodles are thick (all the better to dip with) and the dipping broth is rich tonkotsu (pork bones) based soup.